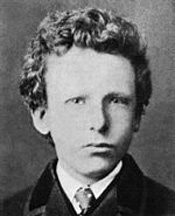 Vincent van Gogh (March 30, 1853 - July 29, 1890) is generally considered the greatest Dutch painter after Rembrandt, though he had little success during his lifetime. Van Gogh produced all of his work (some 900 paintings and 1100 drawings) during a period of only 10 years before he succumbed to mental illness (possibly bipolar disorder) and committed suicide. His fame grew rapidly after his death especially following a showing of 71 of van Gogh's paintings in Paris on March 17, 1901 (11 years after his death). Van Gogh's influence on expressionism, fauvism and early abstraction was enormous, and can be seen in many other aspects of 20th-century art. The Van Gogh Museum in Amsterdam is dedicated to Van Gogh's work and that of his contemporaries. Several paintings by Van Gogh rank among the most expensive paintings in the world. On March 30, 1987 Van Gogh's painting Irises was sold for a record $53.9 million at Southeby's, New York. On May 15, 1990 his Portrait of Doctor Gachet was sold for $82.5 million at Christie's, thus establishing a new price record (see also List of most expensive paintings). Vincent was born in Zundert, The Netherlands; his father was a protestant minister, a profession that Vincent found appealing and to which he would be drawn to a certain extent later in his life. His sister described him as a serious and introspective child. At age 16 Vincent started to work for the art dealer Goupil & Co. in The Hague. His four years younger brother Theo, with whom Vincent cherished a life long friendship, would join the company later. This friendship is amply documented in a vast amount of letters they sent each other. These letters have been preserved and were published in 1914. They provide a lot of insight into the life of the painter, and show him to be a talented writer with a keen mind. Theo would support Vincent financially throughout his life. In 1873, his firm transferred him to London, then to Paris. He became increasingly interested in religion; in 1876 Goupil dismissed him for lack of motivation. He became a teaching assistant in Ramsgate near London, then returned to Amsterdam to study theology in 1877. After dropping out in 1878, he became a layman preacher in Belgium in a poor mining region known as the Borinage. He even preached down in the mines and was extremely concerned with the lot of the workers. He was dismissed after 6 months and continued without pay. During this period he started to produce charcoal sketches. Impressed and influenced by Jean-Francois Millet, van Gogh focussed on painting peasants and rural scenes. He moved to the Dutch province Drenthe, later to Nuenen, North Brabant, also in The Netherlands. Here he painted in 1885. In spring 1886 Vincent van Gogh went to Paris, where he moved in with his brother Theo; they shared a house on Montmartre. Here he met the painters met Edgar Degas, Camille Pissarro, Bernard, Henri de Toulouse-Lautrec and Paul Gauguin. He discovered impressionism and liked its use of light and color, more than its lack of social engagement (as he saw it). Especially the technique known as pointillism (where many small dots are applied to the canvas that blend into rich colors only in the eye of the beholder, seeing it from a distance) made its mark on Van Goghs own style. It should be noted that Van Gogh is regarded as a post-impressionist, rather than an impressionist. In 1888, when city life and living with his brothers proved too much, Van Gogh left Paris and went to Arles, Bouches-du-Rh, France. He was impressed with the local landscape and hoped to found an art colony. He decorated a "yellow house" and created a celebrated series of yellow sunflower paintings for this purpose. Only Paul Gauguin, whose simplified colour schemes and forms (known as synthetism) attracted van Gogh, followed his invitation. The admiration was mutual, and Gauguin painted van Gogh painting sunflowers. However their encounter ended in a quarrel. Van Gogh suffered a mental breakdown and cut off part of his left ear, which he gave to a startled prostitute friend. Gauguin left in December 1888. In May 1890 Vincent van Gogh left the clinic and went to the physician Paul Gachet, in Auvers-sur-Oise near Paris, where he was closer to his brother Theo, who had recently married. Gachet had been recommended to him by Pissarro; he had treated several artists before. Here van Gogh created his only etching: a portrait of the melancholic doctor Gachet. His depression aggravated. On July 27 of the same year, at the age of 37, after a fit of painting activity, van Gogh shot himself in the chest. He died two days later, with Theo at his side, who reported his last words as "La tristesse durera toujours" (French: "The sadness will last forever"). He was buried at the cemetery of Auvers-sur-Oise; Theo unable to come to terms with his brother's death died 6 months later and was buried next to him. It would not take long before his fame grew higher and higher. Large exhibitions were organized soon: Paris 1901, Amsterdam 1905, Cologne 1912, New York 1913 and Berlin 1914.